As a whole, the world's five species of rhinos make up the most critically endangered large animal group on the planet. This is due to the relentless illegal poaching of rhinos for their horns for use in Traditional Asian Medicine. The Rhino Rescue Project has made this video in the hopes of raising awareness about this global crisis and is in the process of having it translated into over a dozen languages including Vietnamese, Cantonese, and Mandarin. Please share this video and join the fight to halt rhino extinction. update (10 Feb 2012): South Africa's Department of Health has added Eritrea to list of countries requiring vaccination against yellow fever. As of 01 January 2012, all travellers from Eriteria are required to show proof of vaccination upon entry into South Africa. Definition of a valid yellow fever vaccination certificate: vaccination should be approved by the World Health Organisation (WHO), and administered at a Yellow fever-approved vaccination centres at least 10 days before departure to South Africa. The vaccine offers protection 10 days after administration. If vaccination is administered less than 10 days before departure, the above-mentioned measures will be applied. On Sunday, 4 September 2011, the time in Namibia changes from UTC +1 (summer time) to UTC +2 (winter time). The time will change at 02h00 (AM). Time will not change in the Caprivi strip, as this area is not subject to summer and winter time changes. The time will change back to summer time on the first Sunday in April 2012 (01 April 2012). Precision Air, Tanzania's largest airline, started a four-weekly service between Dar Es Salaam and Johannesburg's O.R Tambo International Airport in South Africa on 24 August 2011. The airline is flying on Wednesdays, Fridays, Saturdays and Sundays between the two destinations. The flights are operated by a new Boeing 737-300 which can carry up to 116 passengers in business class and economy class. Precision Air is to introduce 5th weekly service on Dar Es Salaam – Johannesburg route from 13 October 2011. The independent Air Transport Rating Agency (ATRA), based in Switzerland, has ranked the ten safest airlines in a recent report. For the study, ATRA examined publicly available information on 15 criteria, such as the average age of the aircraft used or the homogeneity of the fleet. According to the agency, airline safety is not only about accident figures (such on the EU black list), but also about "technical, human, organisational and external" elements. ATRA'S top 10 list is in contrast to the annual Skytrax survey that ranks airlines based on customer service. None of the airlines in the Skytrax top 10 made the ATRA's top 10 safety list. South Africans travelling to Zambia will now be required to have a Yellow Fever vaccination certificate, the Department of Health said on Friday. "Zambia's status has been classified as a low risk," the Ministry said following World Health Organisation's global yellow fever risk assessment. The new policy will be effective from 1 October. From this date, a valid yellow fever certificate will be required for travellers over 1 year old, travelling from Zambia, or having been in transit through a yellow fever risk country including Zambia. update (17 Oct 2011): Round up of the Pro Street Finals from the Maloof Money Cup South Africa hosted in Kimberley. The world's greatest skateboarding event, the Maloof Money Cup, is coming to South Africa and will be will be staged from 29 September to 02 October 2011 in Kimberley in the Northern Cape. The Maloof Money Cup, which was founded by Gavin and Joe Maloof, is the world's largest skateboarding competition in terms of prize money, with more than $450 000 up for grabs in various categories, and will therefore be attracting the world's best professional skateboarders to come to South Africa. The event in Kimberley will be the first MMC in South Africa and the first one out of the United States. The specially build skate park and the vert ramp will later on be donated to the Kimberley municipality. Kudos! Comair Limited, operator of British Airways in South Africa and kulula.com, will start operation scheduled flights from Johannesburg's Lanseria Airport to Maputo in Mozambique and Gaborone in Botswana from 01 September 2011. British Airways will initially be offering eight return flights per week between Lanseria and Maputo and seven return flights per week to and from Gaborone with additional flights to both destinations being added before the end of the 2011. Whilst the Kiwi's may be regular winners, it's been quite a while since Australia have had the chance of winning the Tri Nations trophy. To celebrate this long awaited showdown between the top 2 teams in the world, Kumuka are offering all Aussies and Kiwis up to 30% OFF Kumuka tours - so in the end we all win!! That's 30% OFF for this weekend only and may the best team win!! Take advantage of the strong Aussie and Kiwi dollars and when you select your currency - pay for your tour in $USD, £GBP or €Euro and SAVE! 1. The following regions and products are excluded from the sale North America and Specialist tours. 2. The sale ends 28th Aug 2011 3. The sale applies for tours departing from 01 November 2011 to December 2012. 4. To qualify for a Discount full payment must be made at the time of booking. 5. Offers apply to New Bookings only. 6. All bookings must be made online using Kumuka Agent interface. 7. Offers apply to bookings made in GBP, USD and EURO only. 8. Offer apply to prices displayed on the Kumuka website or in 2011-2012 brochure only. 9. Some tours are excluded. Check the individual tour page on www.kumuka.com or contact Kumuka for further details. The Mai Mai Market, located on the corner of Anderson and Berea streets in Johannesburg's city centre, is the city's oldest market. The market was originally dedicated to traditional African medicine or "muti" and is still giving the visitor a glimpse into the exotic world of ethnic medicine, but you can now also buy traditional artefacts, including Zulu attire, clothes made from animal skins and feathers, walking sticks, knobkerries, shields, sandals or beaded items. The market home to about 600 people, many of whom have lived in the complex for decades, evolving into a close-knit and self-contained community. Dance competitions featuring dancing troupes from hostels across the city are a regular feature of the complex. If you are planning to visit Johannesburg, don't miss out the Mai Mai Market. Kudos @ Jennifer Cipperly for the video! A record number of tourist visited the East African country of Kenya between January and June 2011. Tourism Minister Najib Balala told a news conference that arrivals to Kenya rose to 549,083, up 13.6 percent from the same period last year. The estimated revenue for the first six month of 2011 are currently standing at 40.5 billion shillings, up 32 percent from 30.7 billion in the same period last year. During the period under review the United Kingdom, the United States of America, Italy, Germany and India were the top source markets. In 2010, a record 1.1 million tourists visited Kenya, and the tourism industry earned a a record 74 billion shillings. Video: "Seriously Beautiful Cape Town"
Published on vimeo already back in December 2010, the video "Seriously Beautiful Cape Town" give us a 01:30 preview of what local production company Silver Bullet is planning for 2011 - a film about Cape Town that shows the "interesting and special places Cape Town has to offer, some that even the abundance of our tourists have never seen before..."
The Kingdom of Bahrain's national carrier Gulf Air announced the launch of services to three more new destinations - Rome, the Italian capital, Entebbe, the hub of Uganda’s commercial sector and Juba, the capital of newly independent country, South Sudan. Flights to Rome will begin from 30 November 2011 (four flights per week), while flights to Entebbe will begin from 05 December 2012 (four flights per week) and to Juba from 07 February 2012 (three flights per week). Inclunding the three new destinations, Gulf Air operates scheduled services to 49 destinations in 30 countries across Africa, Asia and Europe. It has extensive codeshare agreements with other airlines and special partnerships with Jet Airways and Oman Air's Frequent Flyer Programmes. 5th issue of free digimag "Travel Namibia extra" out now! The team of Travel Africa, a (printed) magazine covering all kind of travel-related information about the African continent, just published the 5th issue of their online digimag "Travel Namibia extra". 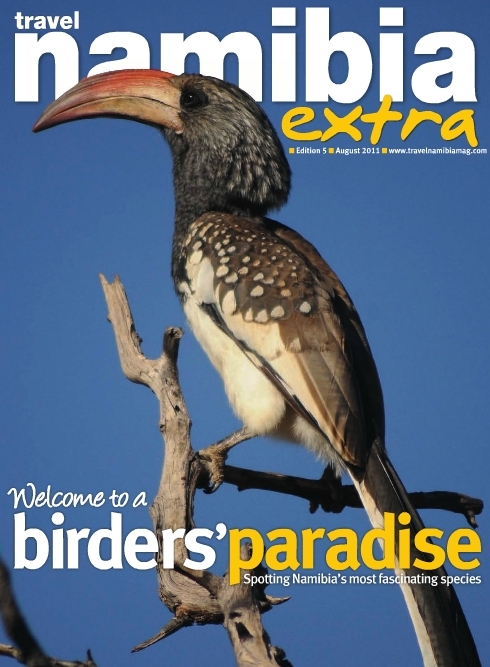 16 pages full of interesting pics, maps & articles about bird spotting in Namibia. Kudos to Gecko Publishing! South African airline Airlink will increase the number of flights from Kruger Mpumalanga International Airport to Livingstone in Zambia from 10 March 2012 (additional flight on Saturdays) and 07 August 2012 (additional flight on Tuesdays). The schedule will then operate Mondays, Tuesdays, Wednesdays, Fridays and Saturdays. The flights depart Kruger Mpumalanga International Airport at 11h55 arriving Livingstone at 13h50 and departing Livingstone at 14h20 arriving Kruger Mpumalanga International Airport at 16h45. Now that the Aquila Private Game Reserve is suffering from such a big loss and is still fearing for Absa's life (Absa died in morning hours of the 25 Aug 2011), it seems time to promote the beauty of the Game Reserve, its various attractions and tourism highlights. Check out Aquila's promo video, visit them and/or please spread the word about it! Dyan deNapoli, known as "the Penguin Lady" and head of her own educational company, tells the story of the world's largest volunteer animal rescue. She describes how in June of 2000, the oil tanker Treasure sank off the coast of South Africa, so that some 1,400 tonnes of heavy fuel oil leaked from the bulk carrier into the sea off Cape Town. All this happened during the best breeding season on record thus far for the then-threatened (and now endangered) African Penguin. A total of more than 40,000 oiled penguins were saved during the rescue. Dyan deNapoli's current book "The Great Penguin Rescue: 40,000 Penguins, a Devastating Oil Spill, and the Inspiring Story of the World's Largest Animal Rescue" is available from the TravelComments.com eShop! Official Tanzania Tourism Board promo video "Tanzania - Authentic Africa"
I must say that I actually quite like it as the video highlights all the great tourism spots of Tanzania, it's widlife and people and various cultures. Well done @TTB! This is your chance to make huge savings on your next tour with Kumuka Worldwide. Simply book and pay for your tour in US Dollars, Euro or Pounds before Sunday 21st August 2011 and you will SAVE up to 30%* on a huge range of Kumuka Tours. • Select your currency - Pay for your tour in $ USD, £ GBP or € Euro and SAVE! • The following regions and products are excluded from the sale. Family Tours, Africa lodge Based tours, North America and Specialist tours. • The sale applies for tours departing from 01 November 2011 to December 2012. • To qualify for a Discount full payment must be made at the time of booking. • Offers apply to New Bookings only. • All bookings must be made online using Kumuka Agent interface. • Offers apply to bookings made in GBP, USD and EURO only. • Offer apply to prices displayed on the Kumuka website or in 2011-2012 brochure only. • Some tours are excluded. Check the individual tour page on www.kumuka.com. Cape Town is one of the top 10 fishing destinations in the world! According to he online travel website Cheapflights.com, Cape Town in South Africa is among the top 10 fishing destinations in the world! Visitors flock to Africa’s southernmost city for culture that’s brimming with excitement. Fishermen flock for its coastline, brimming with tuna. The area has some of the richest tuna grounds in the world and also some of the globe’s toughest fighting fish. A diverse ecosystem guarantees you’ll see albatross, killer whales and dolphins galore. Tuna season lasts from September to June, but there are opportunities to throw your net year round. In an effort to raise public awareness of humanitarian assistance, the UN General Assembly has designated 19 August as World Humanitarian Day. The day honours those, who have lost their lives in humanitarian service and those, who continue to bring assistance and relief to millions. It also seeks to draw attention to humanitarian needs worldwide and to explain what humanitarian aid work entails. "If I Could Change" features Ziggy Marley and artists from around the world. Produced by Jerry 'Wonda' Duplessis. The Southern African countries of Angola, Botswana, Namibia, Zambia and Zimbabwe have signed an agreement on 18 August 2011 to create a giant conservation zone covering both the Okavango and Zambezi river basins. A total of 14 national parks and nature reserves, including world-famous Victoria Falls and the Okavango River delta, will be linked through the Kavango-Zambezi Transfrontier Conservation Area (Kaza), which is stretching over an area half the size of France. The conservation zone will be the largest protected tourism zone in the world. A single visa for tourists visiting South Africa & Mozambique? update (19 Aug 2011) - Voice of America (VoA) is now also reporting about it! According to the Mozambique News agency (AIM), Mozambique's Tourism Minister Fernando Sumbana announced that the governments of Mozambique and South Africa will soon begin to issue single visas for tourists who wish to visit both countries. The Malaysian National News Agency is furthermore quoting the minister saying that the new "single visa" initiative will cover 14 European Union countries. Bloomberg Businessweek is citing the Mozambican independent daily O Pais reporting that, according to South African Tourism Minister Marthinus Schalkwyk, the initiative might be implemented ‘soon’ in all 14 countries of the Southern African Development Community. Can anyone confirm this? Any more info about the initiative? Conde Nast Traveler announced the winners of the magazine's fifth annual World Savers Awards, honoring travel companies from around the world for their leadership in social responsibility in six key areas: education, health, poverty, preservation, wildlife, and "doing it all". Located on the white sandy beaches of Mozambique, this hyper-secluded getaway has leveraged upscale travel to change the lives of 15,000 Mozambicans by giving them access to clean water when they never had it before. They also provide school meals for 800 children, have distributed 9,000 mosquito nets, have built two new primary schools, and have provided 162 secondary school scholarships. An elegant farmstead on a wildlife reserve set in South African wine country has created a self-sustaining ecosystem and economy whose guests receive a lesson in wastewater management. The hotel also pays employees more than 30 percent above what the law requires, with a goal for all workers to afford access to health care as well as education for their families, and enabled 13 previously disenfranchised farmers to rent land directly from the government. World Savers Awards Methodology: The award winners have to meet exacting standards. The editors chose 53 finalists from 131 applicants. The judges (including academics, CEOs, philanthropists, and Conde Nast Traveler editors) then ranked the applicants in each area of social responsibility: poverty relief, preservation (environmental/cultural), education programs, wildlife conservation, and health initiatives. The final winner of each award was determined by compiling the judges' rankings. Travellers planning a trip to countries where Yellow Fever is prevalent have been advised to visit their nearest travel clinics and be vaccinated against the virus. Health Department spokesperson Fidel Hadebe announced on Monday that the vaccine is now available in South Africa, following the recent shortage of Yellow Fever vaccine. "Travel clinics in Gauteng started receiving their stock from [Monday] and travel clinics in other provinces are to receive their stock from 17 August 2011," Hadebe said. He noted that the Yellow Fever vaccine shortage occured because the World Health Organisation recently added other countries as yellow fever high risk territories, resulting in higher demand for the vaccine. Are you looking for (overland) tours in Southern & Eastern Africa in September or October 2011? Check Kumuka's late deals for some great discounts! Please note that the discounts on these trips can change day to day without notice, so don't delay! The BBC has produced a new and very interesting podcast about Zimbabwe as part of their BBC documentaries podcast series Assignment. Have you bought a diamond recently? Would you really know where it came from? Assignment goes into Zimbabwe's Marange diamond fields and uncovers evidence of torture camps and widescale killings. As the international community argues over whether these diamonds should be sold on the open market, we ask if President Robert Mugabe will ever face prosecution for these crimes. Namibia's flag carrier Air Namibia is increasing the number of flights to Johannesburg as well as to Cape Town from from two flights a day to three. Passengers travelling between Johannesburg and Walvis Bay will continue to enjoy the six flights per week service, via Windhoek. The transit time at Windhoek to Walvis Bay is one hour. The Cape Town to Walvis Bay service will remain direct. The airline will also introduce a new daily, direct service between Windhoek and Lusaka in Zambia. Air Namibia will also increase its current six-weekly international flights between Windhoek and Frankfurt to daily flights, effective from beginning March 2012. This service offers convenient connections from Cape Town, Johannesburg, Luanda, Lusaka, Victoria Falls and Maun. Airports Company South Africa (ACSA) has published the on-time performance results of domestic airlines’ flying out of OR Tambo in Johannesburg, Cape Town International Airport, and Durban's King Shaka International Airport on its website. Intrepid Travel: Win a "mystery trip" for two!